The Forster Ranch Area of San Clemente offers many options of real estate: homes, condos and luxury estates with panoramic views. What is really good about this area as opposed to others that have comparable homes in San Clemente, is that Forster Ranch doesn't have mello-roos. Some neighborhoods offer amenities like pools and parks and trails that interconnect the streets. Award winning schools, a short drive to the beach, a beautiful trail that sorrounds the neighborhoods and other San Clemente amenities, make the Forster Ranch homes always in high demand. View all Forster Ranch Homes and condos currently available for sale. For more information on any of these homes or other San Clemente locations, please contact us by email or call us at (949) 888-6788. Read more about the Forster Ranch Real Estate available options in the different neighborhoods. Move up to the luxurious lifestyle you have aspired to in this extensively upgraded home at Cantomar at Forster Ranch in San Clemente. Impressive interior dimensions of approx. 4,237 s.f. are evident upon entering the residence, which features a 2-story foyer with elegant wrought-iron staircase. A fireplace warms the formal living room, the dining room hosts built-in wine storage and backyard access, and a downstairs bedroom serves as a library. Are you looking for San Clemente’s best kept secret neighborhood? You just found it in the Reserve West. Nestled in the hillside and tucked in on a single loaded cul de sac, this home is located on a coveted street that offers pool size lots and ocean views! Welcome yourself home with a two story entry that leads into the open dining and living areas. The main level also features a guest bedroom and bathroom and a huge kitchen and family room. Little known to many, Forster Ranch features some really nice custom estates in the back of the hills. But the area is commonly known for having more affordable homes that are newer, or with larger lots than the common San Clemente ones, or because it doesn't have mello roos, yet offers trails, parks, pools in some neighborhoods, and has some of the best schools in the San Clemente. Neighborhoods like Rim Rock and Tocayo Hills usually have smaller single family homes ( around 1500 sq ft), with larger lots. Ashton and Ridgemore are newer neighborhoods ( homes built around 2000) with medium size homes ( 2000 sq or more) and there's the newer Reserve, with homes that are around 3000 sq ft, with many offering gorgeous views of the ocean. Forster Ranch doesn't have a small shopping center like other areas in San Clemente, but it has close proximity to other ones, and to the medical centers nearby. The two main access streets from the 5 Freeway, are Camino de la Estrella, that heads onto Camino de los Mares, and Camino Vera Cruz, which feed most of the neighborhoods in Forster Ranch. Access to the southern Forster Ranch neighborhoods like the Reserve and Forster Highlands, can also be done Via Avenida Vista Hermosa connecting onto Camino Vera Cruz. Little known is that there's a great trail atop the Forster Ranch homes and neighborhoods. It's called the Forster Ranch Ridgeline trial , and it follows the crest of the hills on the South and East of the Forster Ranch area for about 3.2 miles. 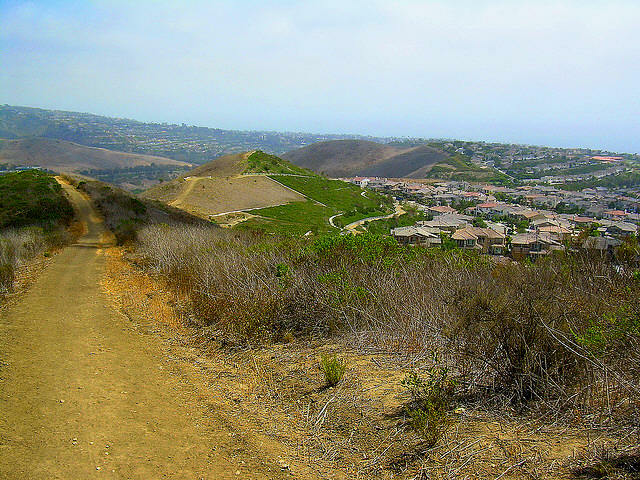 This trail has a number of steep sections,it's all natural surface is surrounded mostly by open space, offering views looking down San Clemente’s Talega area and the ocean beyond. For the kids, the community offers several green areas and the Forster Ranch Community Park, which is commonly known as the San Clemente Pirate Park because of its pirate theme. There are palm trees, alligators and pirate ships. Some neighborhoods have also private parks and pools within their association. We are licensed Realtors in Forster Ranch and are ready to help you with your real estate questions and needs. Let us know if you would like to help you buy a Forster Ranch home, or if you are currently thinking of selling your home, we handle short sales in the area too.